In June 1896 the Northamptonshire C.C., Lionel E. Adams, summoned his fellow C.T.C. 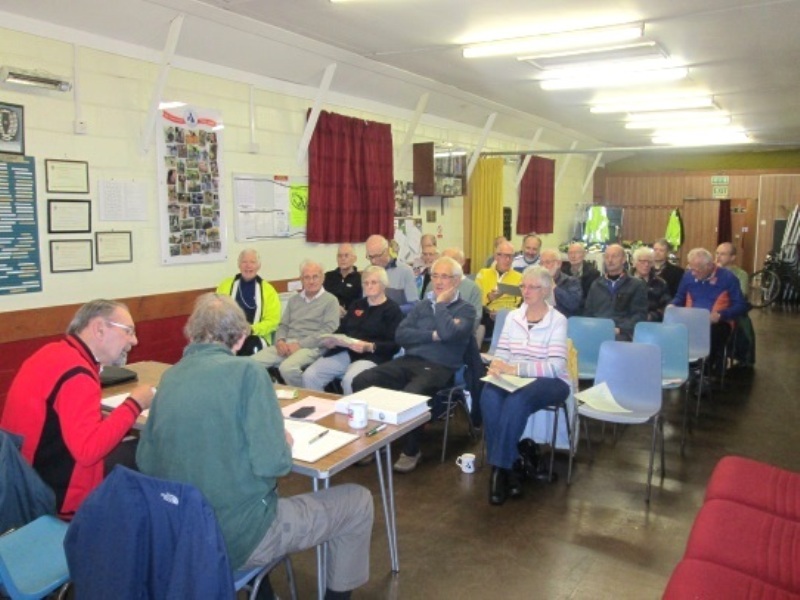 members to a meeting in the county town to discuss the chances of a local D.A. The project did not materialise, and for twenty-four years were allowed to elapse before anything more was heard of it. Then the local members began to stir themselves, and after necessary formalities had been accomplished the Northamptonshire D.A. became an established fact. 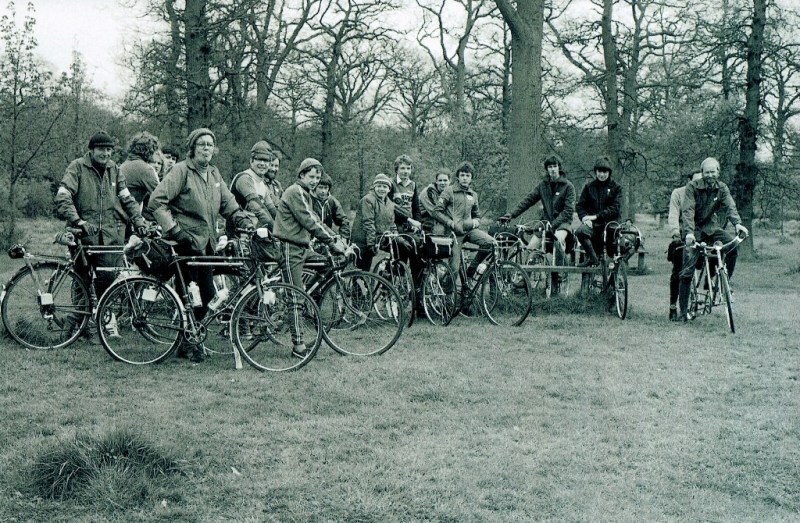 The first meeting of the Northants D.A. was held on October 9th 1920, Mr F.C.W. Stevenson, chief consul for Rutland and Leicestershire, giving an interesting address to the assembled members. Mr F. Bostock was elected president, Mr. E. D. Kennard chairman, Mr. G. Chantrey hon. runs secretary, Mr. B. Clowes hon. auditor, and Mr. E. Skinner, 20 Stimpson Avenue, Northampton, hon. secretary, with a committee of four. Everything promises well for the success of the new D.A. which Mr. Skinner's enterprise has brought into being. 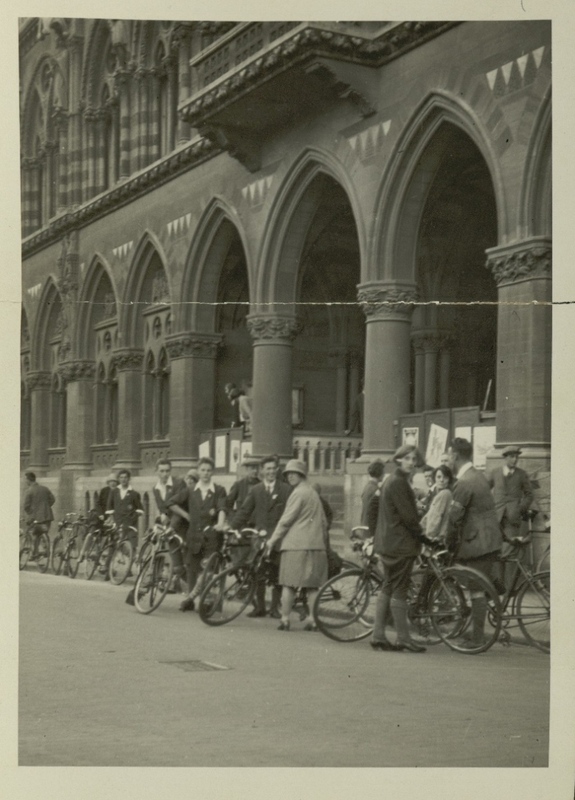 The Guildhall 1922 the first meeting point for Club runs. The Northamptonshire D.A. continued to thrive through the twenties. 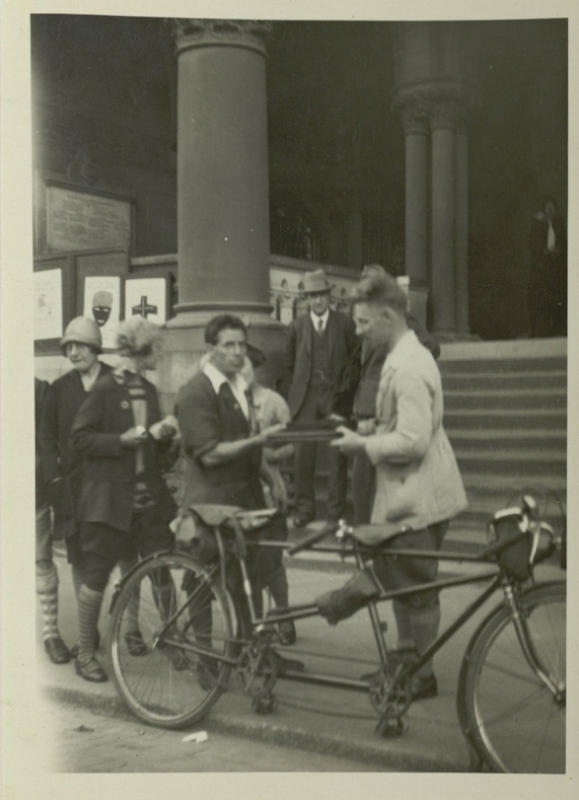 In 1923 it took part in the first National Bike Week Campaign to promote cycling for fitness and fun, a national 888 mile relay visited Northampton to get a signature from the Mayor. 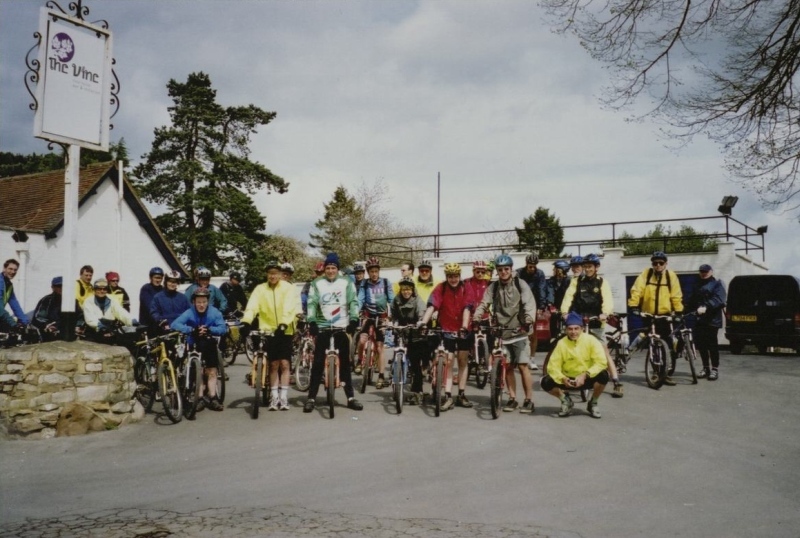 Locally the club organised a mass ride from the market square and a timed hill climb among other events. N.D.A. 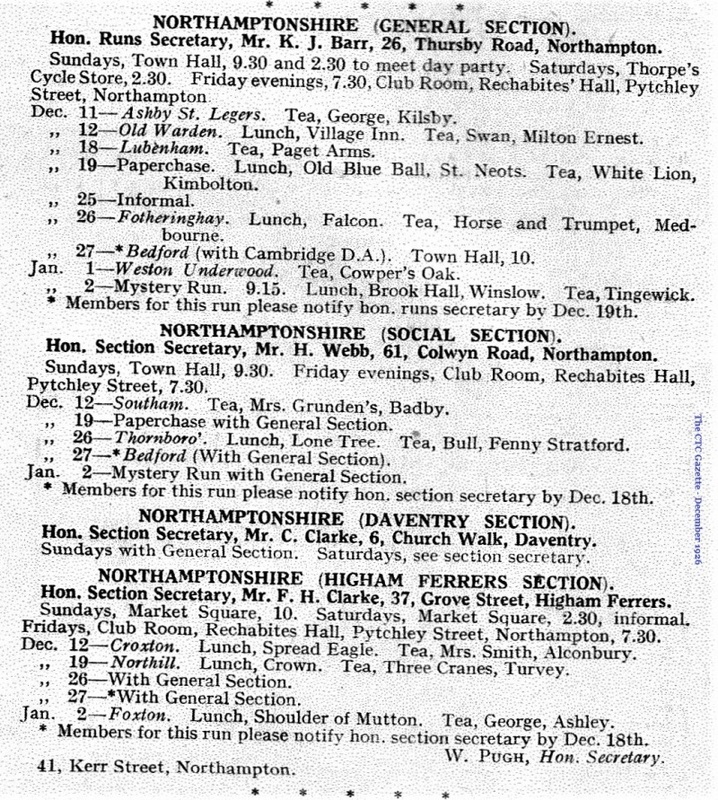 Sections Rides Calender for December 1926. A Wellingborough Section was formed in 1928. 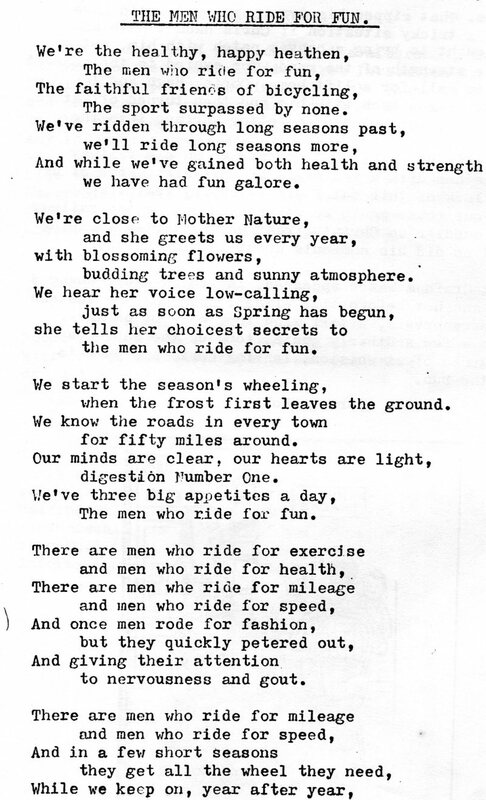 In 1927 the famous cycling Journalist "Wayfarer" became the President of this club. In June 1928 CTC celebrated its Golden Jubilee year by sending a message of congratulations and good wishes to H.R.H. 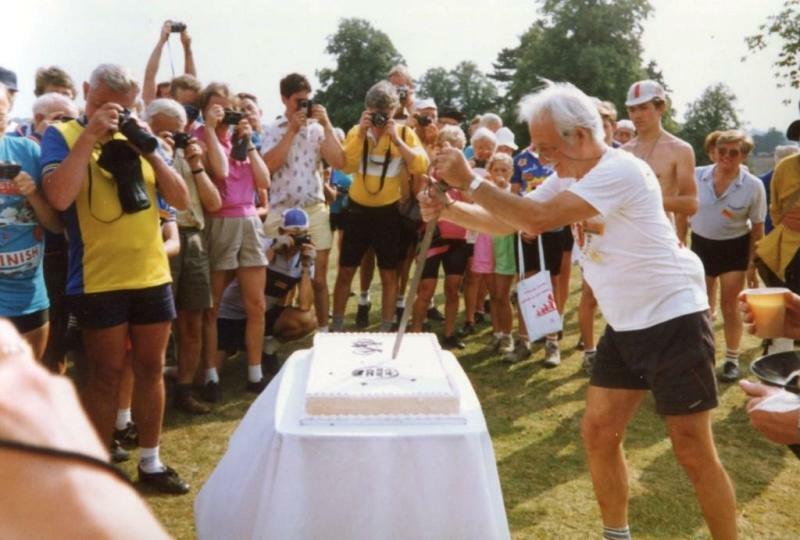 the Prince of Wales on his birthday, a lifetime member, and to make this message particularly novel they organised a relay ride of its members, who in thirteen days covered over, 2100 miles, calling on 95 Civic heads for their signatures onto a vellum roll, from a large number of cities and towns in England, Scotland and Wales. Finishing at Marlborough House, the vellum roll was later presented to H.R.H. N.D.A. 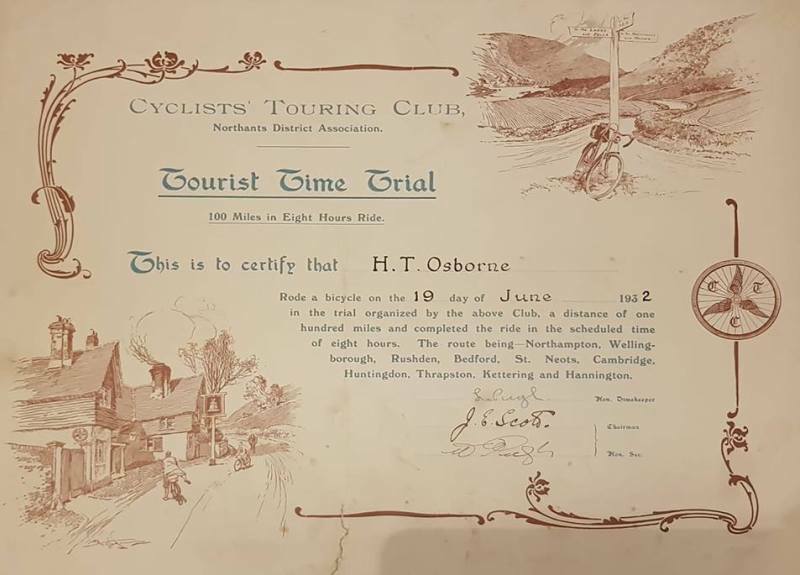 100 Mile Time Trial Certificate from 1932, signed by the Chairman and two other committee members. 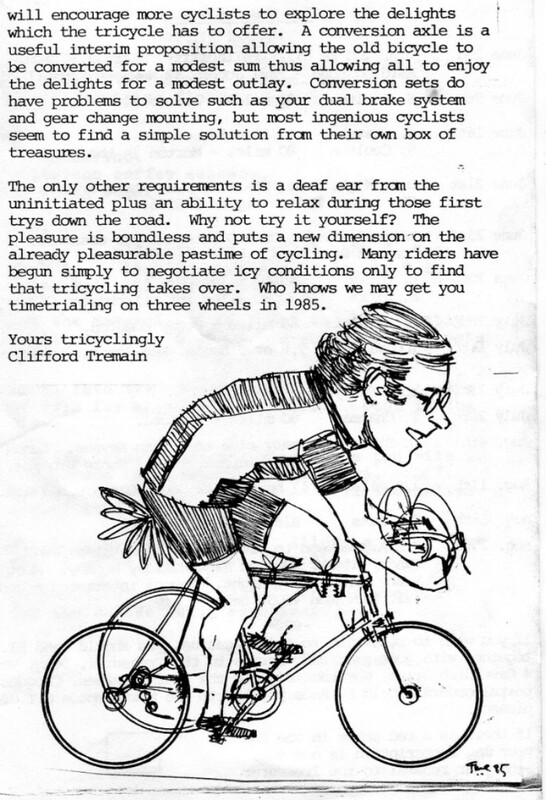 In the 1930's racing bicycles with drop handle bars came into play. 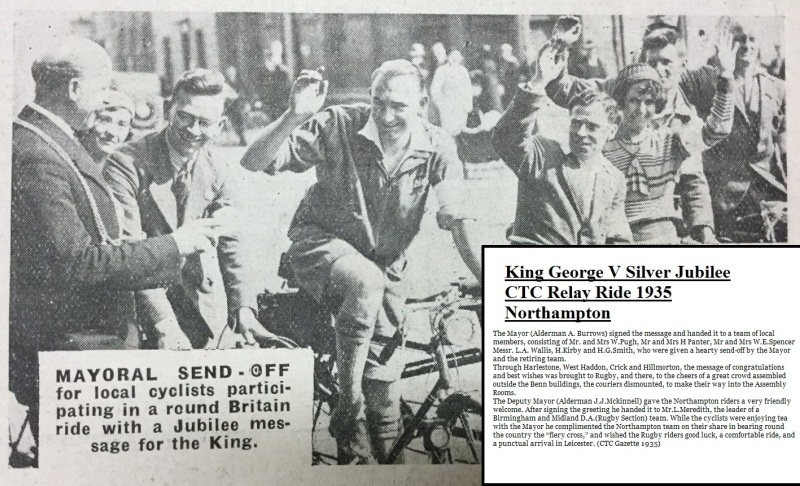 The CTC Nationally organised another relay ride in 1935 to celebrate King George V Silver Jubilee, who became its First Royal Patron in 1910. Here is a film about it - CTC 1935 Jubilee Ride. 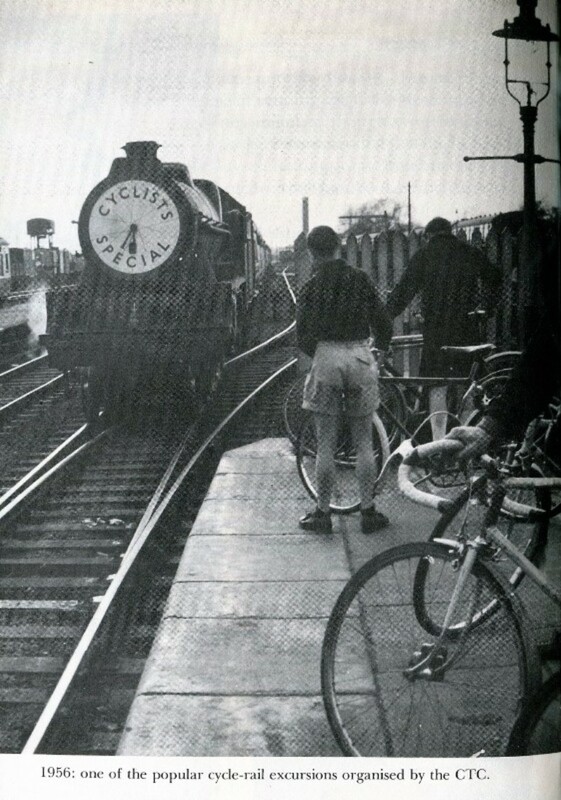 After the 2nd World War with rationing of petrol and other goods cycling continued to be popular. The Northamptonshire District Association continued through the 1950's finally coming to a halt in 1967 as fewer people pursued the pastime. Old CTC Gazettes indicate it had supported 5 or 6 thriving sections in the area during its lifetime. 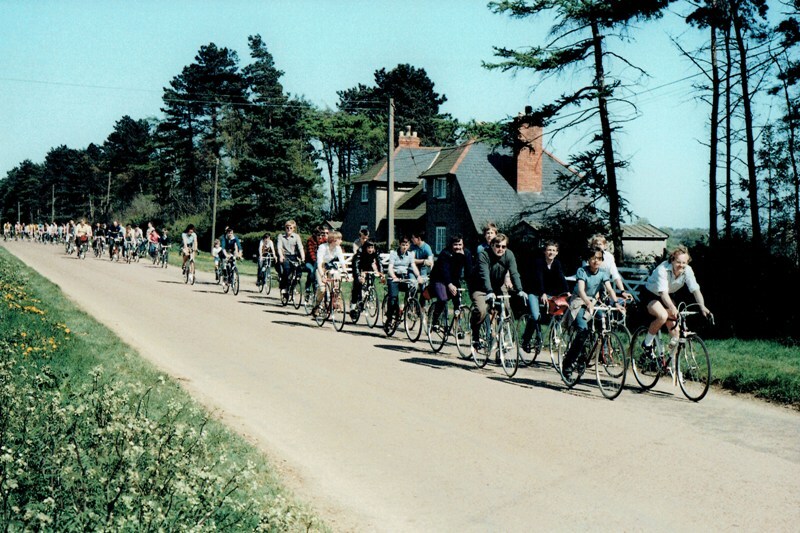 Cycling through Great Brington 1940's to 1960's. 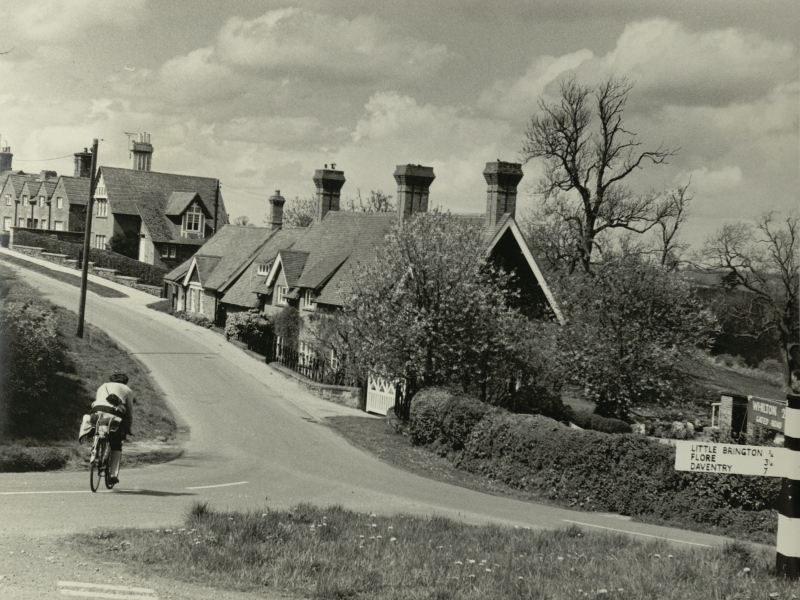 A 15 minute Archive film documents a popular CTC excursion held in the Midlands during 1955, which shows the era of the 1950's. 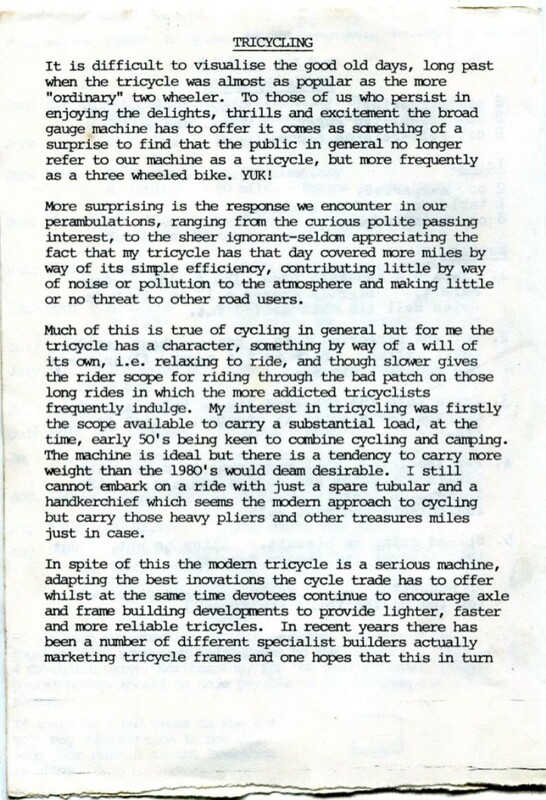 Invitation Ride - 14th October 1979 on the Moulton to Pitsford Road. Passing through Brixworth, Creaton and Raventhorpe. 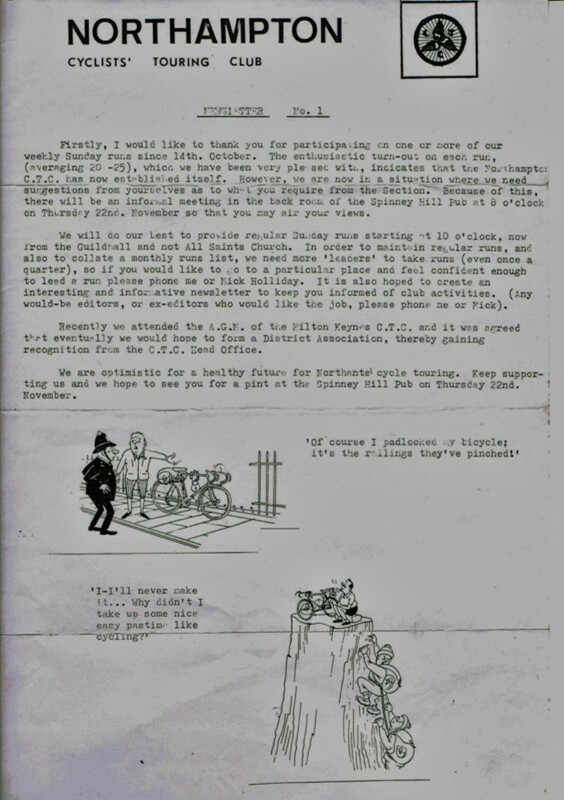 The Northampton Section was re-formed in October 1979, by Mick Holliday, after receiving a call from Geoff Caverhill, in London, informing him that there was no CTC Section in Northamptonshire. 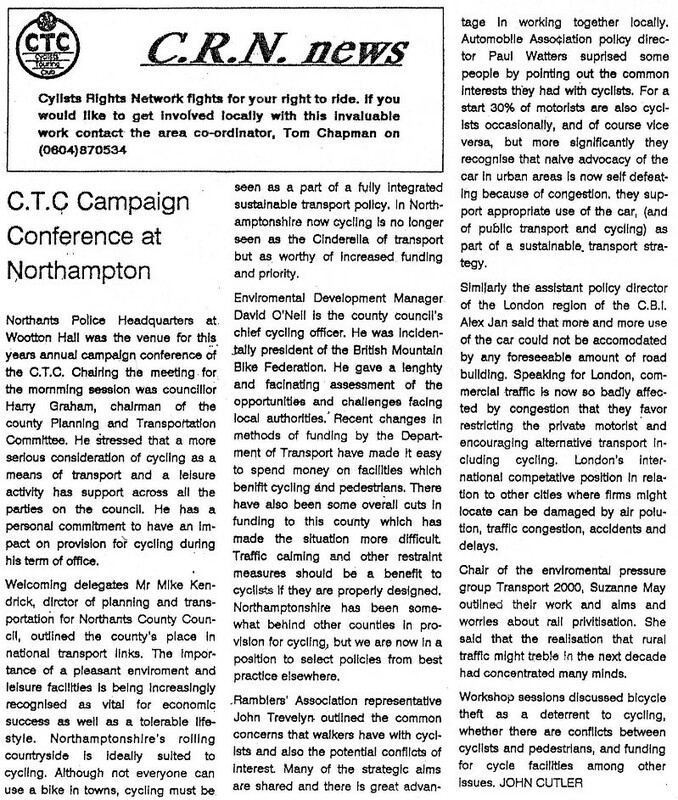 A bi-monthly CTC Northampton Section Magazine was started in February 1980 called the HUBBUB giving members information on forthcoming Club runs, D.A.Events, Social Events, book reviews, food recipes, sales and anything else considered interesting. Printed at White & Bishops it ran throughout the 1980's. 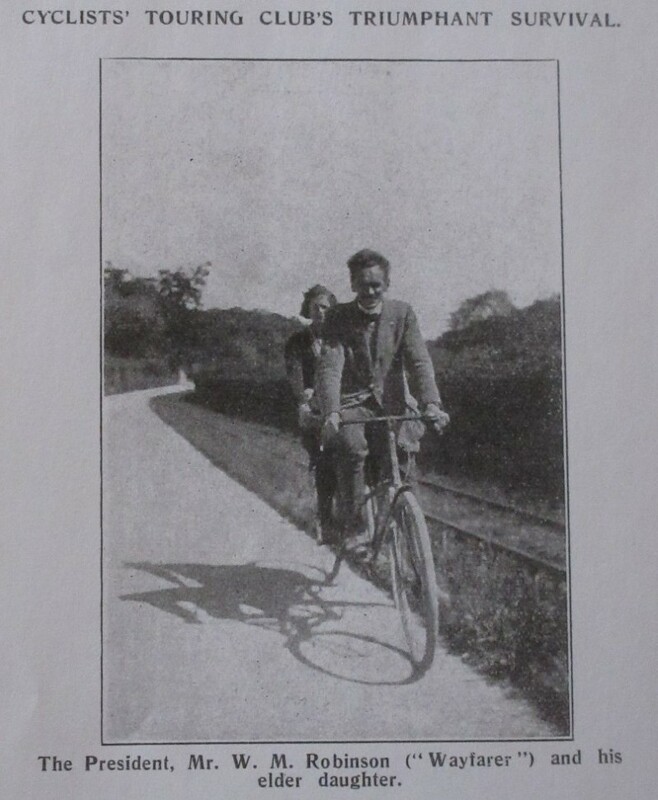 Salcey Forest L to R Ivor Wilson (Publicity) and his wife. 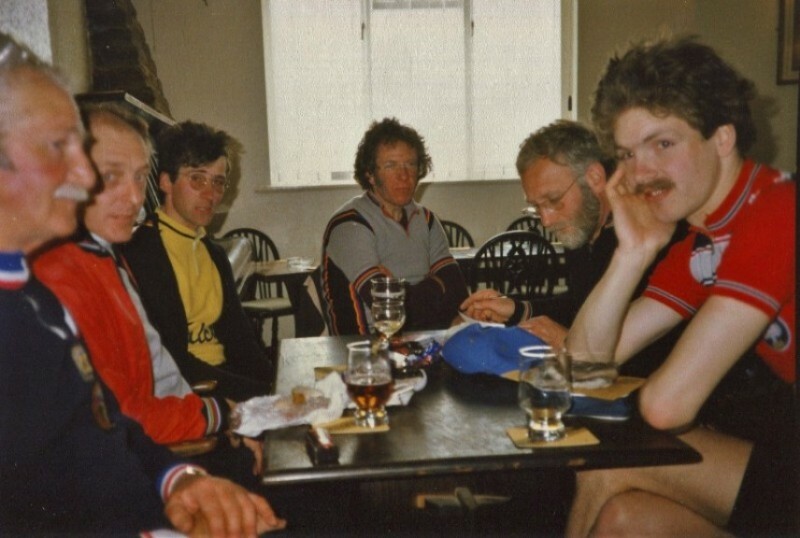 On the right of the picture are Geoff Taylor, Mark Dalley and Paul Jones 1979. Bartholomew Arms, Blakesley with CTC sign on the wall, the "Winged Wheel". Mark Dalley on a "hilly 100" ride. 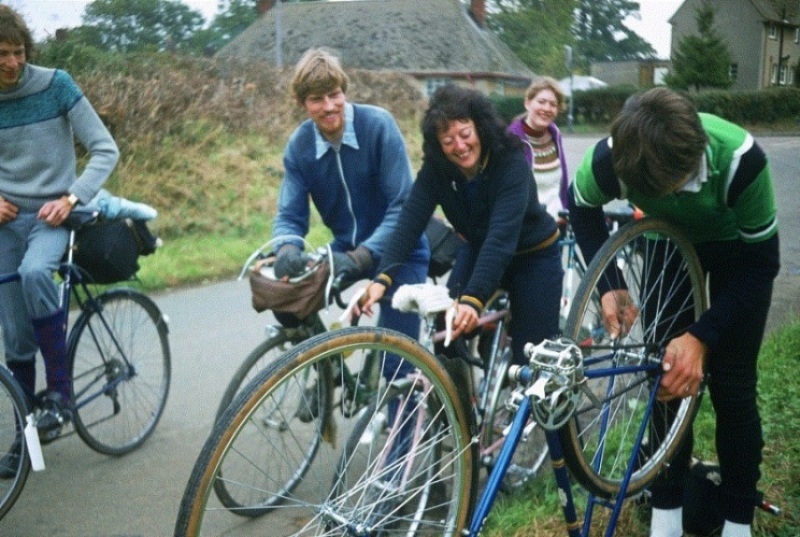 Geoff Caverhill, Pete Coulson, Barbara Garbutt, Sue Holliday, and Chris Garlick mending his bicycle. 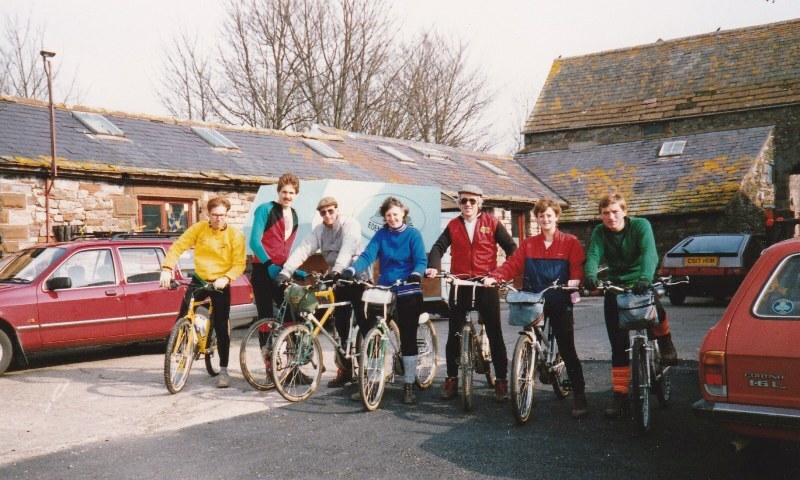 CTC Northampton trip to Cumbria, Easter 1987. 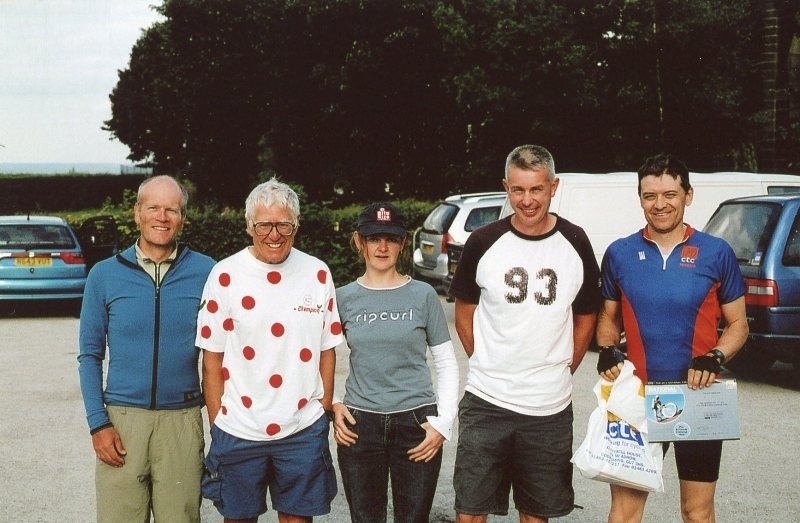 L to R David Wood, Paul Bass, Paul Jones, Sue Hastings, Bob Hastings, Christine Bass and Mark Bailey. Tom Chapman and Stuart Leahy. 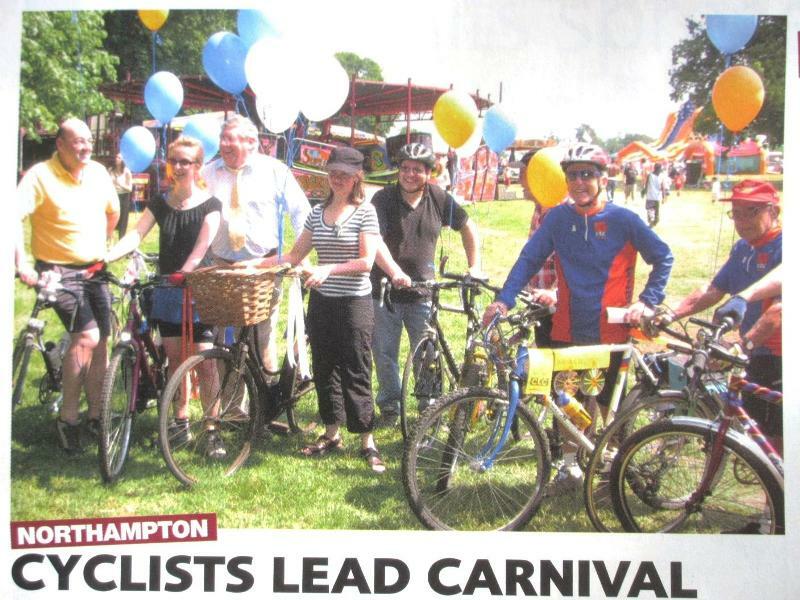 First News article of the newly reformed Northampton CTC. 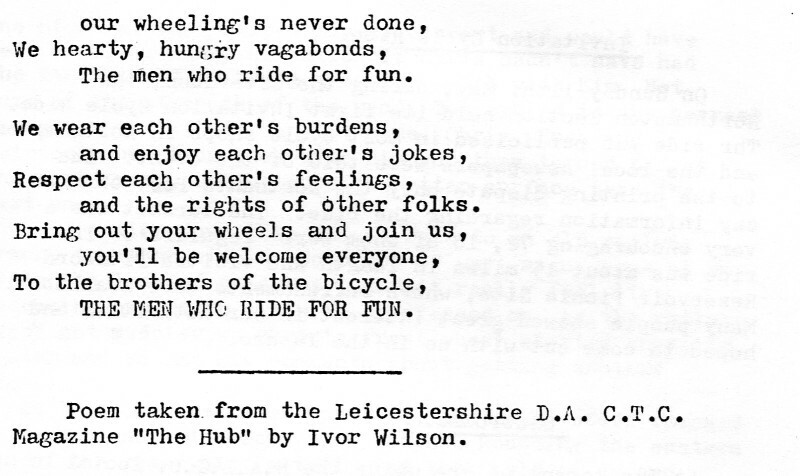 Hubbub Poem by Ivor Wilson. 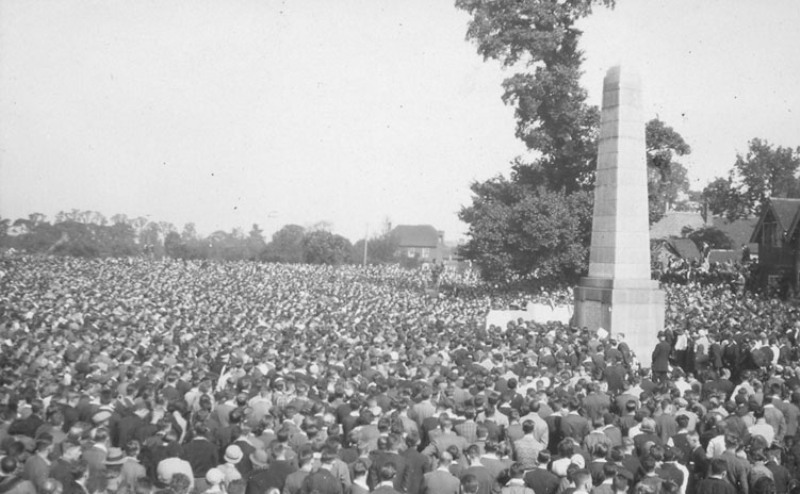 Unveiling, in 1921 of the Cyclists' War Memorial on Meriden Green, Warwickshire, by Lord Birkenhead. 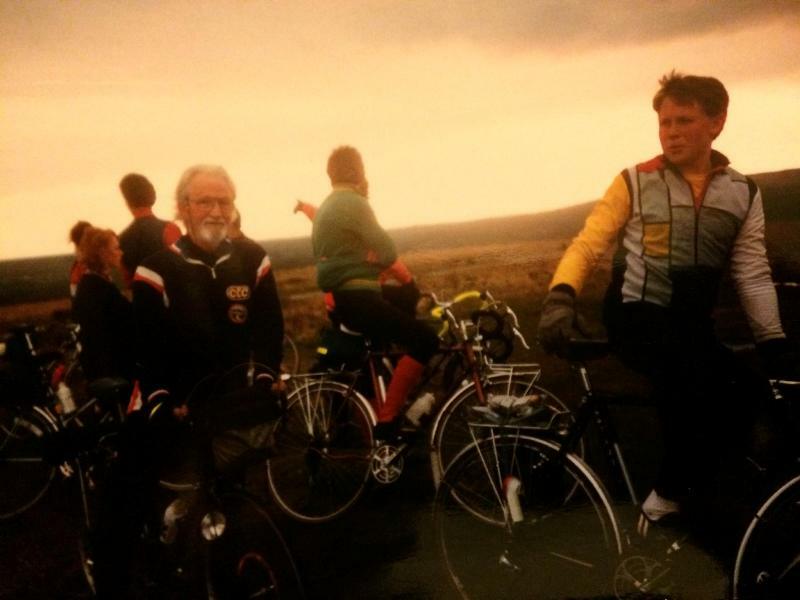 Mark Dalley outside the Guildhall in 1988 ready to ride to the Clubs Xmas Dinner at Long St. In the 1980/90's 3 local sections were formed. 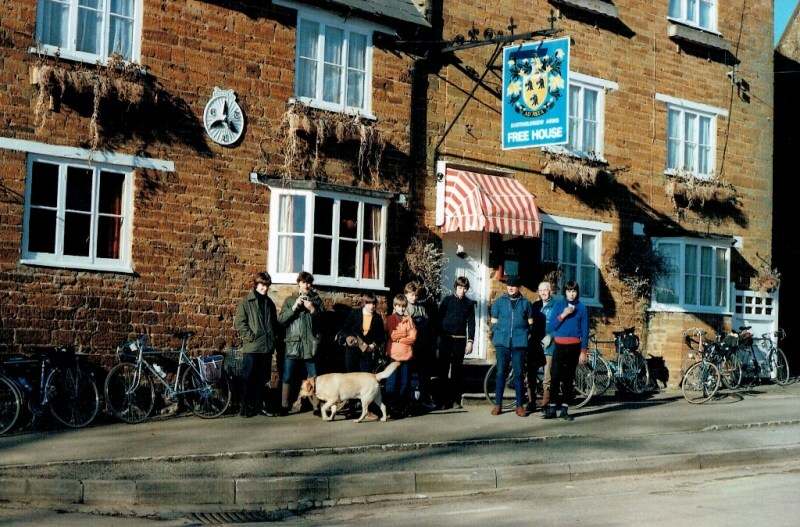 Kettering by Max Scott on May 11th 1984, Winslow by Anne Bonham in 1990 (later to become Winslow Wheelers under Margaret Lowery, affiliated to CTC) and Wellingborough by Matt Embleton during the 1990's. The HUBBUB became a D.A. Magazine in March 1990, printed quarterly to a decreasing circulation it lasted to the mid to late 1990's. 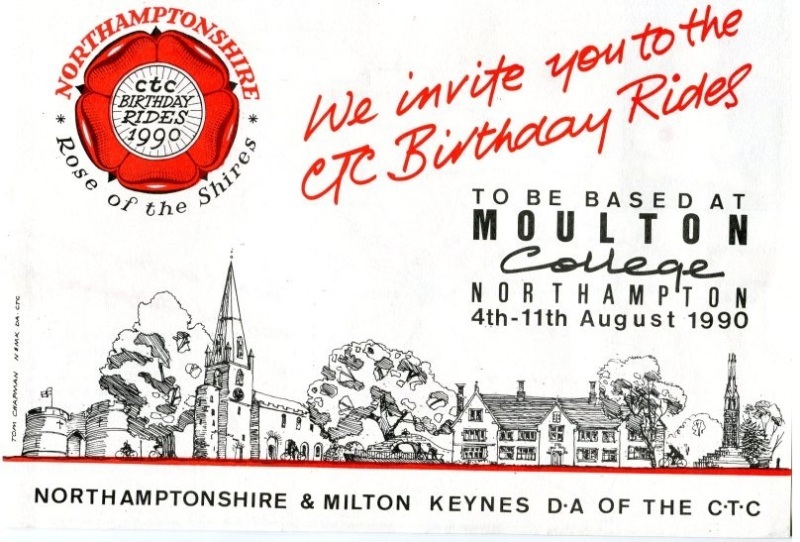 In 1990 Northampton CTC hosted the annual CTC Birthday Rides at Moulton College. 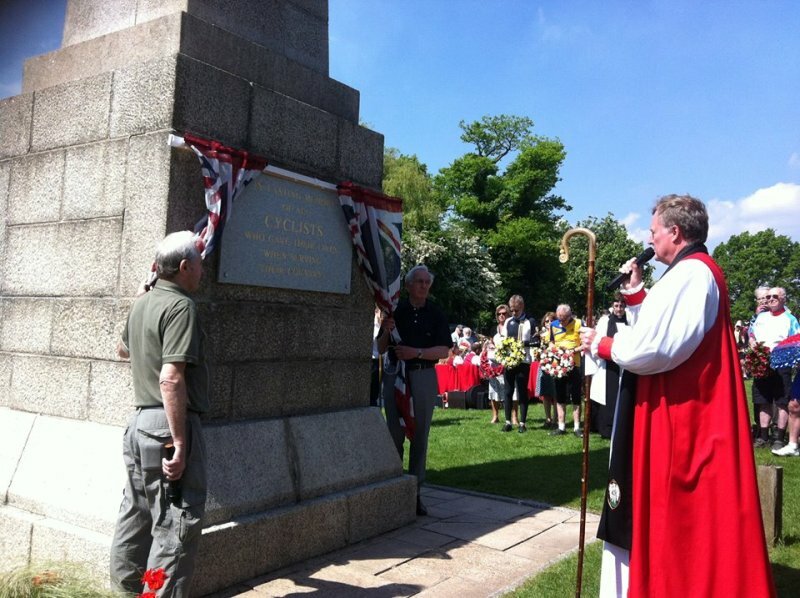 Above Tom Chapman cuts the enormous Birthday Cake in the grounds of Holdenby House, where King Charles was incarcerated after the battle of Naseby in 1645 before being transferred and beheaded outside Banqueting House, Whitehall, London in January 1649. 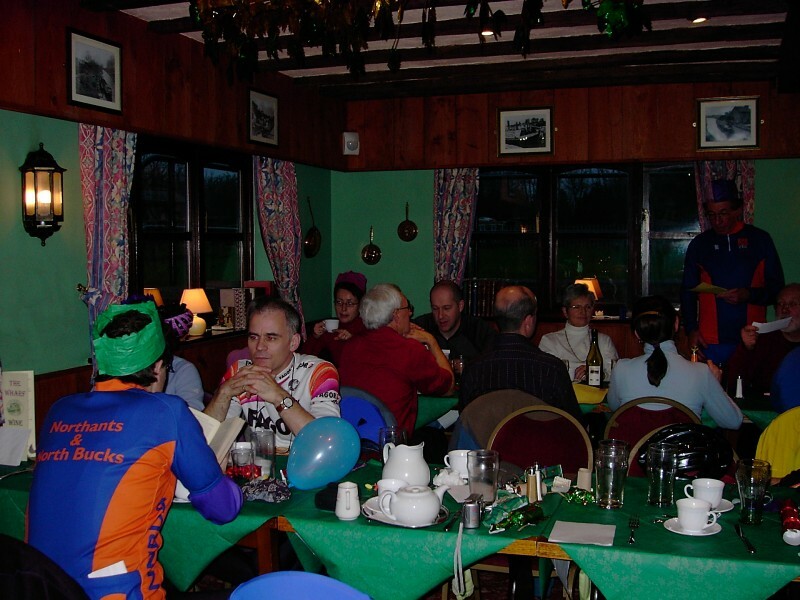 The Birthday rides in 2002 were held at short notice, and consequently not a full week, instead over a long weekend based in Milton Keynes, part of the North Bucks area of the D.A. 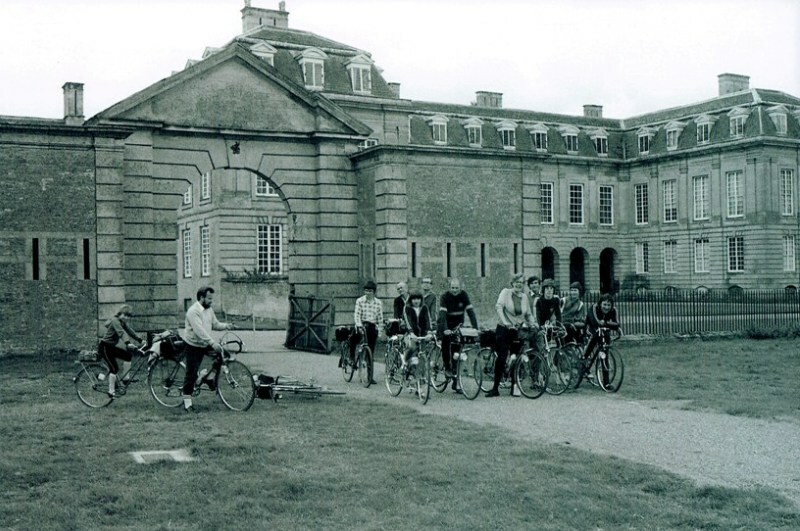 The CTC Birthday Rides returned to Northamptonshire nineteen years later, using Oundle School as its accommodation. 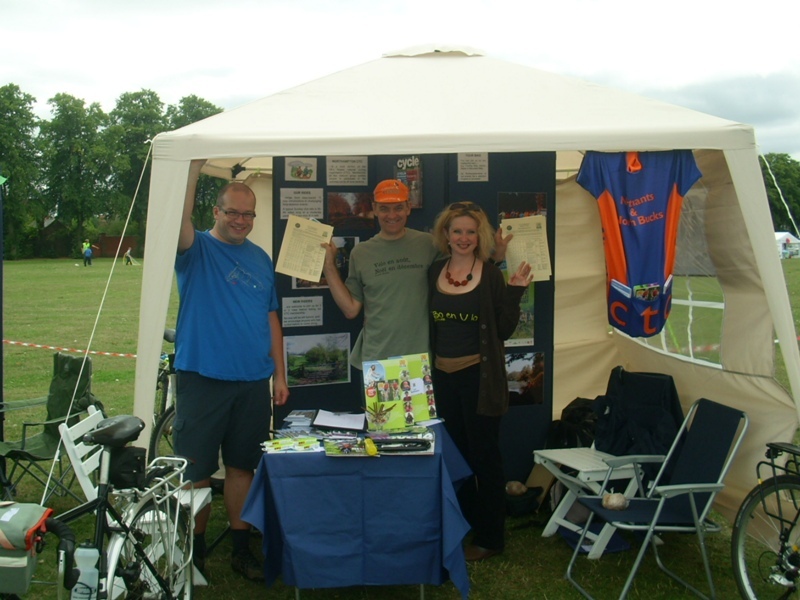 This was organised by Max Scott and volunteers from local CTC groups. 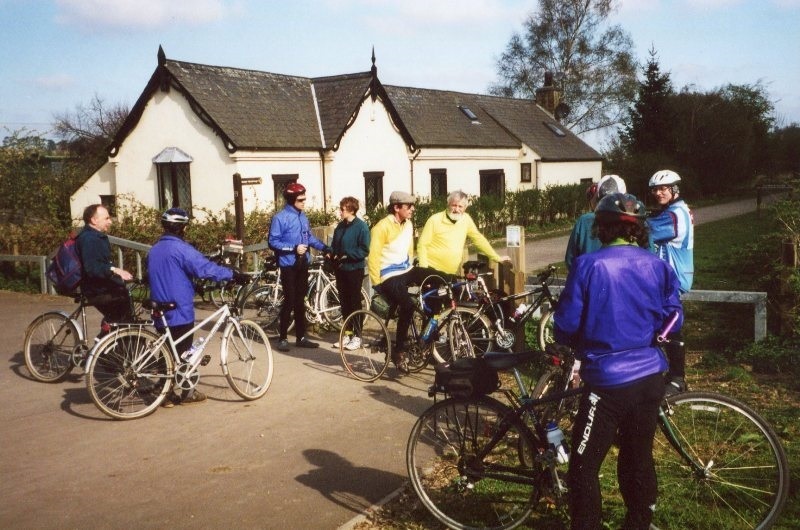 Brampton Valley Way 2002. One of the new starting points. 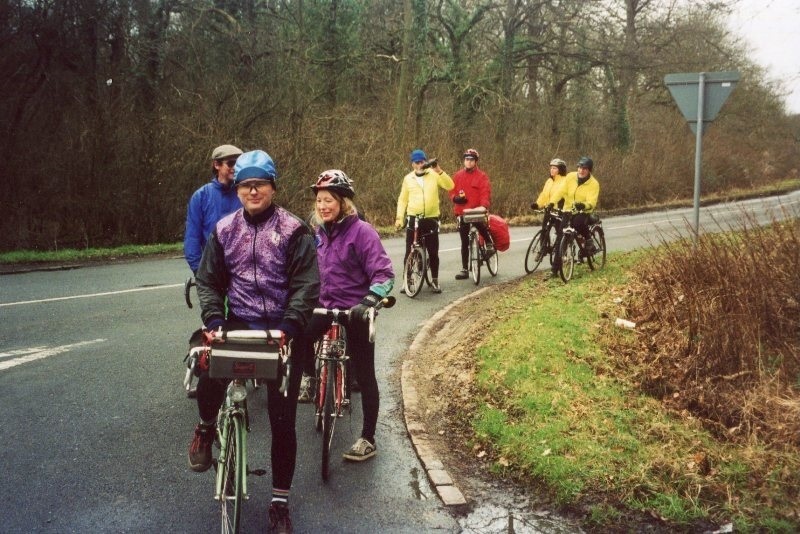 Peter Crighton leading a ride in 2003, 1st Webmaster 2003-2015. 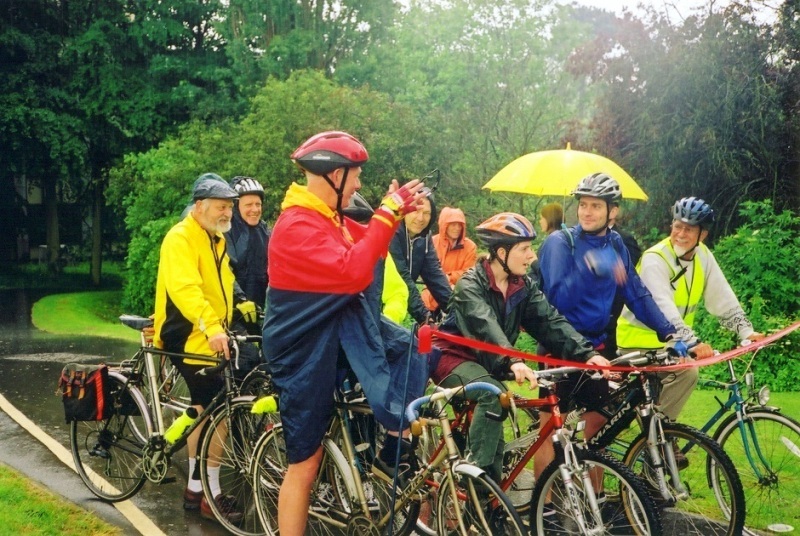 125th Anniversary Regional Relay Ride, 8th of June 2003. Northampton to Lincoln. Covering all five County District Associations. 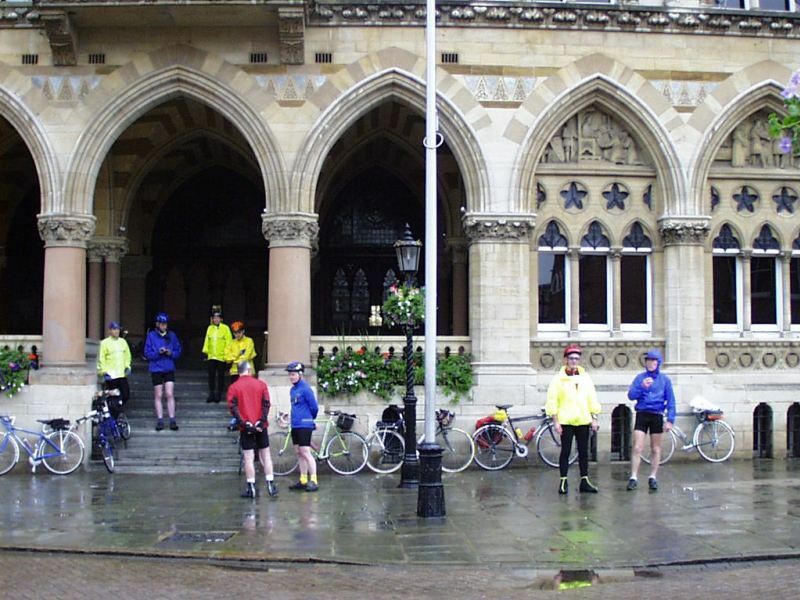 Northampton Guildhall to Abbey Park, Leicester, CTC Northampton Relay Team had ten riders. 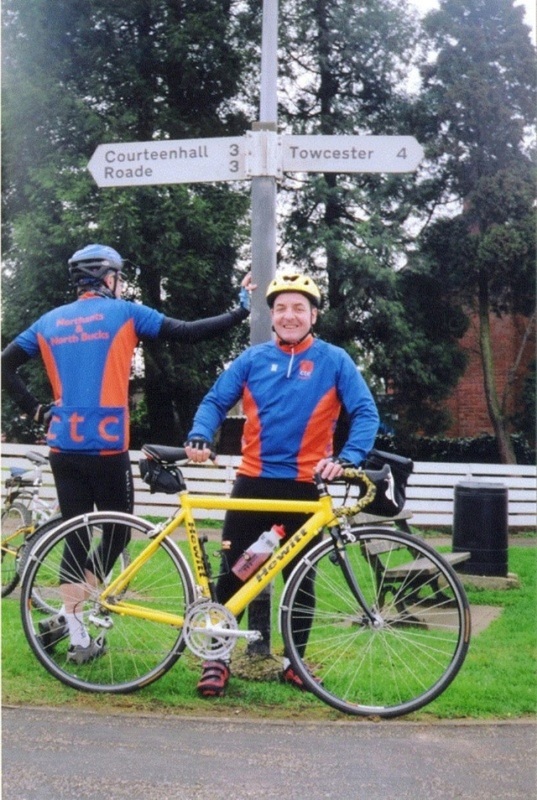 John Dunkley wearing a yellow top, hands over a specially engraved baton to CTC Leicester to pass on to CTC Derby - CTC Nottingham - CTC Lincoln. 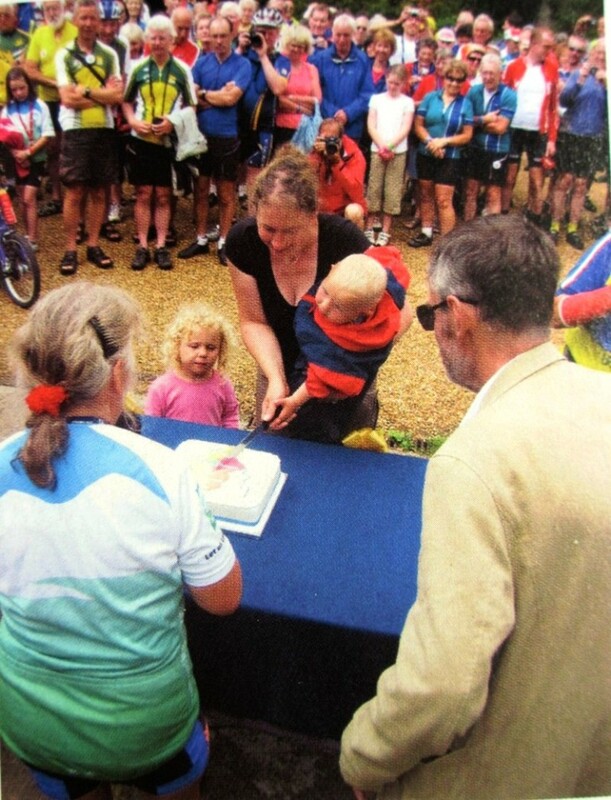 In 2003 CTC Celebrated its 125th Anniversary by having its Birthday Rides in Dorset. 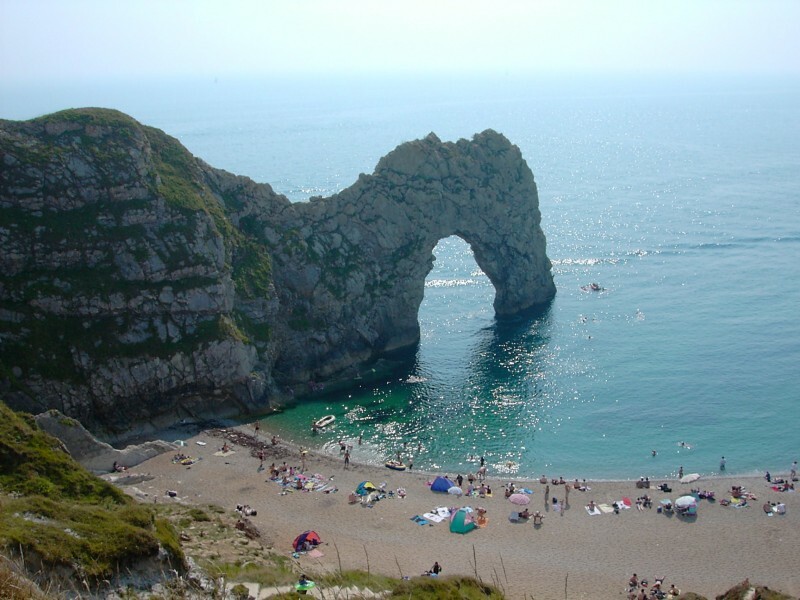 Some of the local members enjoyed their week there by camping and touring around the area during a summer heatwave. Max Scott & Co stop for lunch with Camping Trailers on their way to the Birthday Rides. 2011. 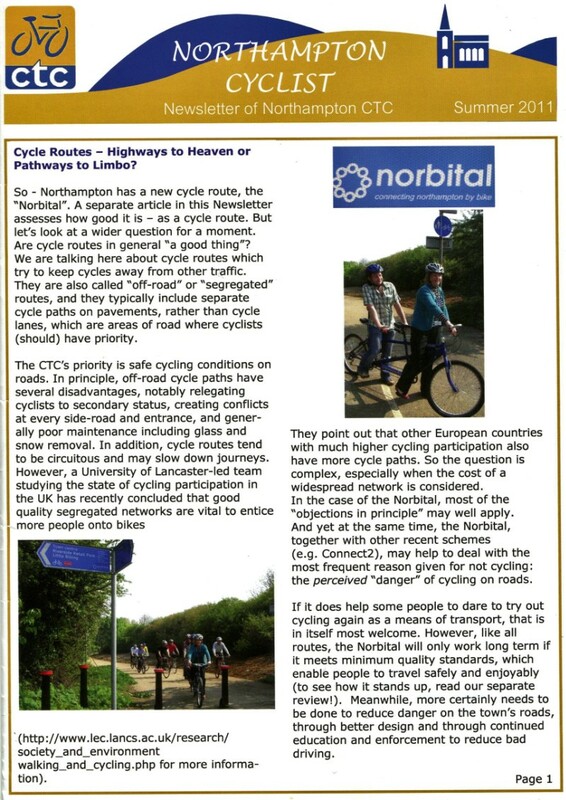 The Northampton NORBITAL cycle route is opened. 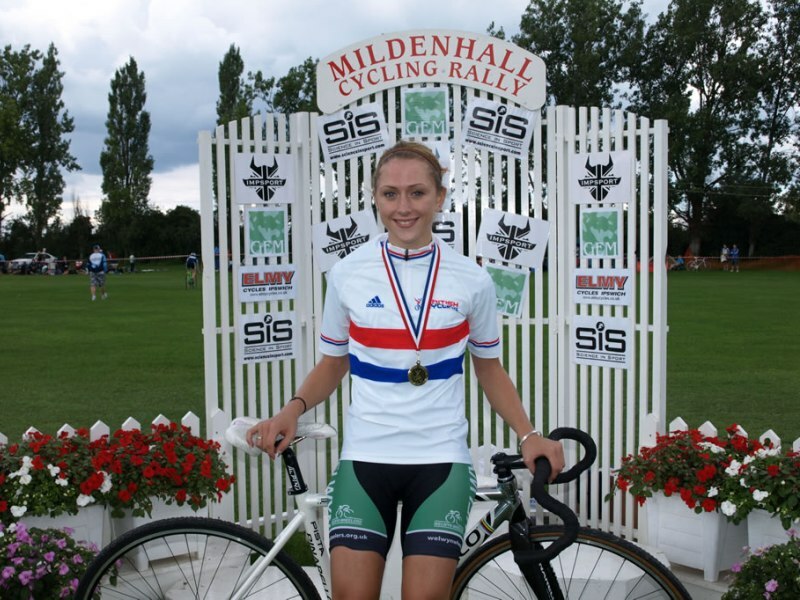 2012 was the year of Great British Cycling. 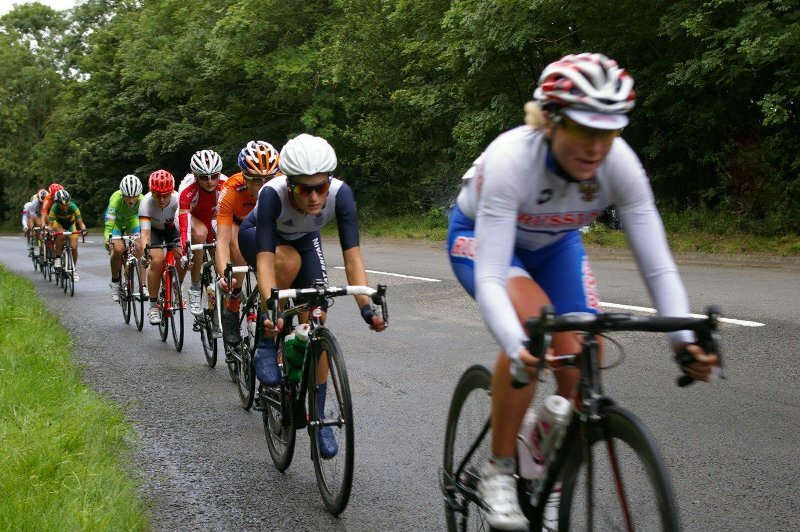 In 2014 Northamptonshire hosted the first stage of the inaugural Women's Tour. 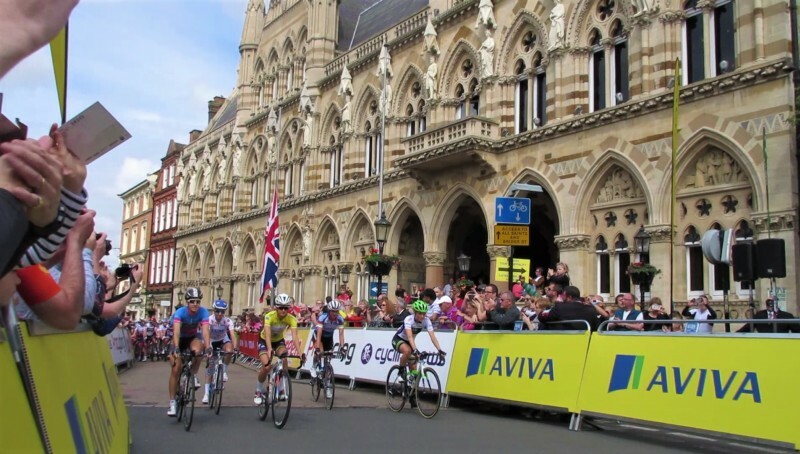 In 2016 the Women's Tour started from Northampton Guildhall. 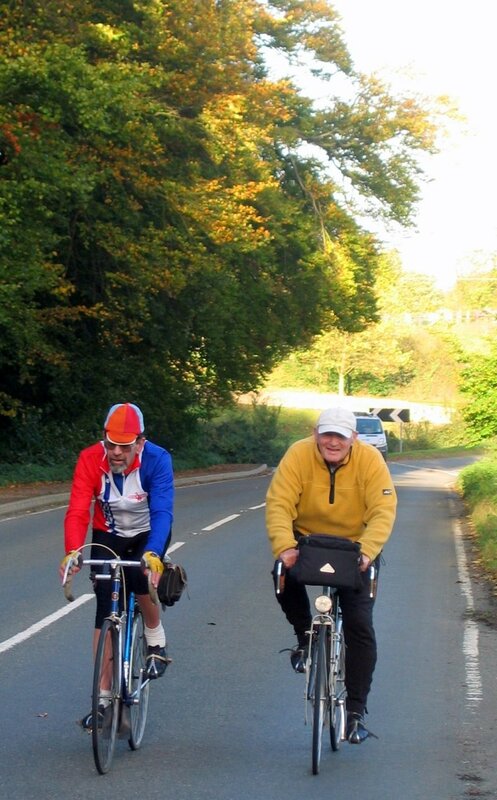 In 2006 Bill Simpson started the GUY BARBER MEMORIAL CHARITY RIDE in memory of his friend. 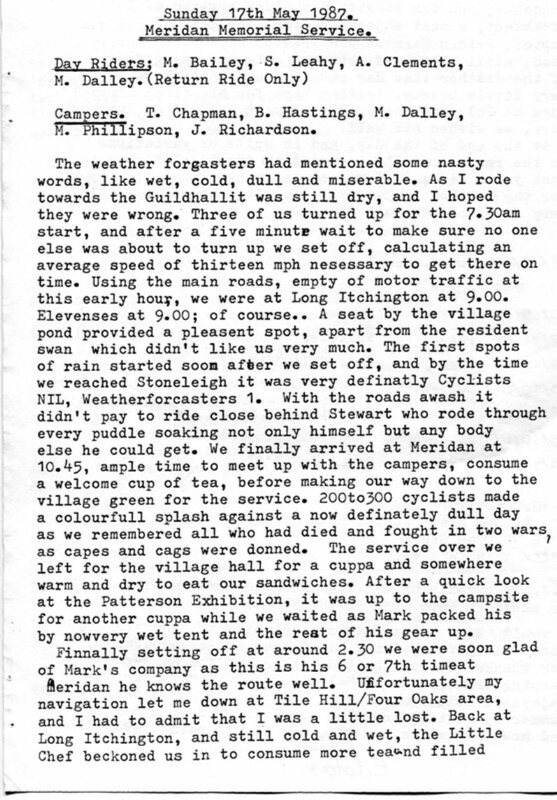 Guy Barber was a Vintage Cycle enthusiast and enjoyed riding his Penny Farthing around the County. 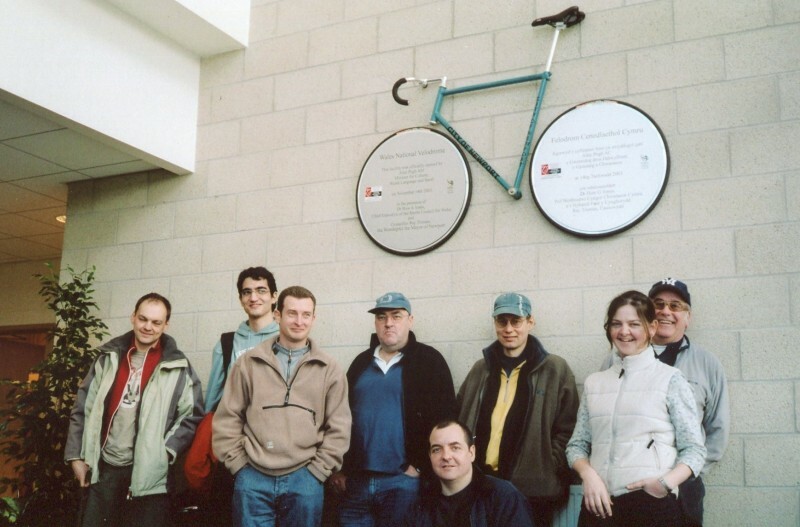 His bicycle had the names of CTC founders and early cyclists engraved on its frame. 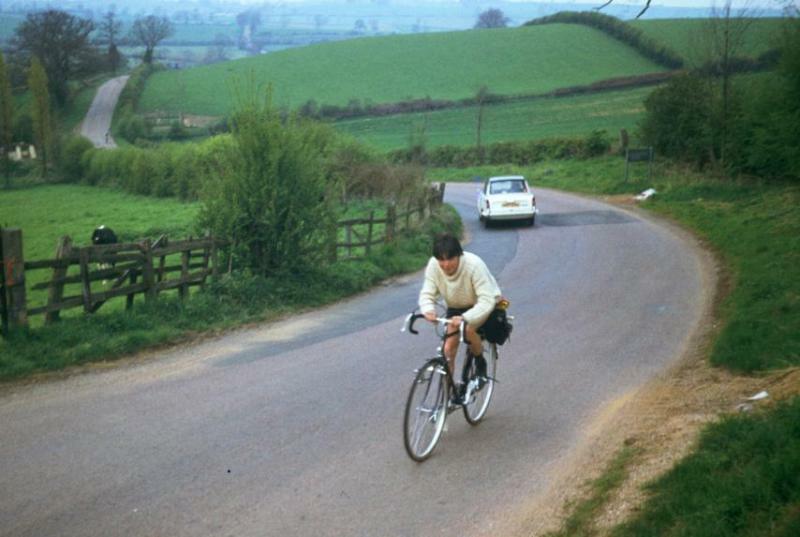 On one particular day he rode to Cambridge, on his return to Northampton he felt so good he decided to ride to Oxford as well! 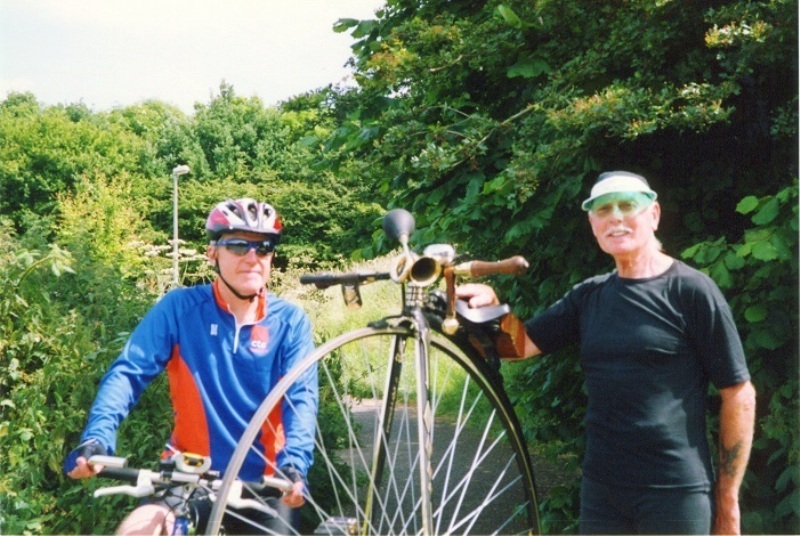 Pictured above Brian with Guy and his Penny Farthing. 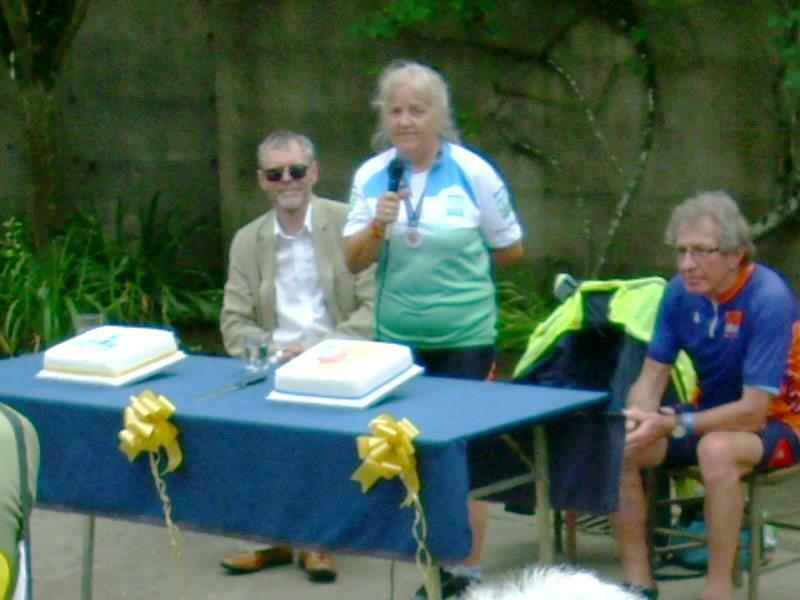 The annual charity ride benefits 'Headway' while the route commemorates that one particular day by going to St Neots and sometimes Cambridge. 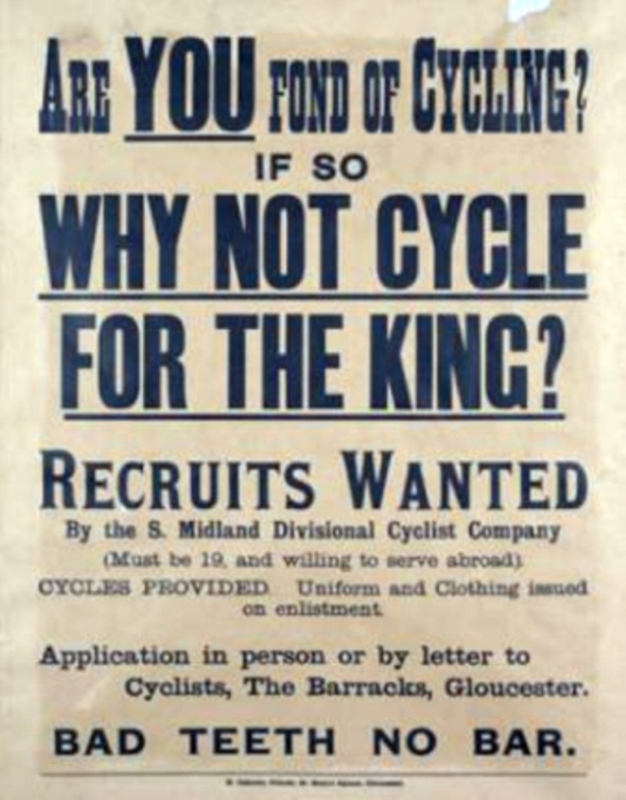 In the 19th Century many cycling clubs emerged in Northampton, with varying levels of subscription fees, uniforms and rules. 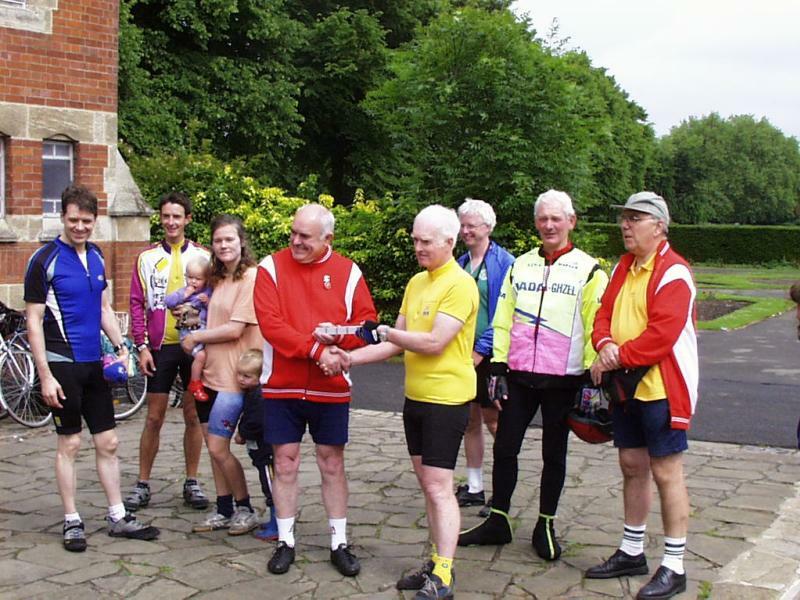 Such as St James Cycling Club, The Northampton Bicycle Club, The Victoria Cycling Club, The College Street, The Rovers Club, The Good Templars Cyclist Club and The All Saints Club. The Captain of the Rovers Club Mr John Porteous instigated the first Cycle Parade in 1891 which evolved into the modern carnival parade. 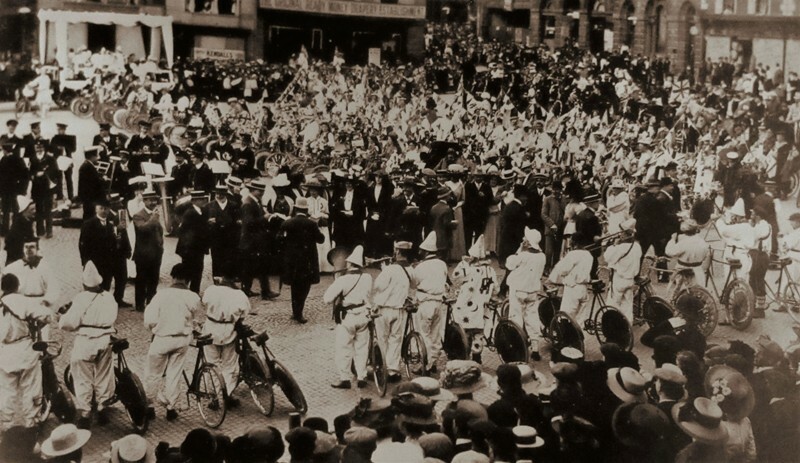 Cyclists assembled on the Market Square in 1911 for the 21st Cyclist Parade. 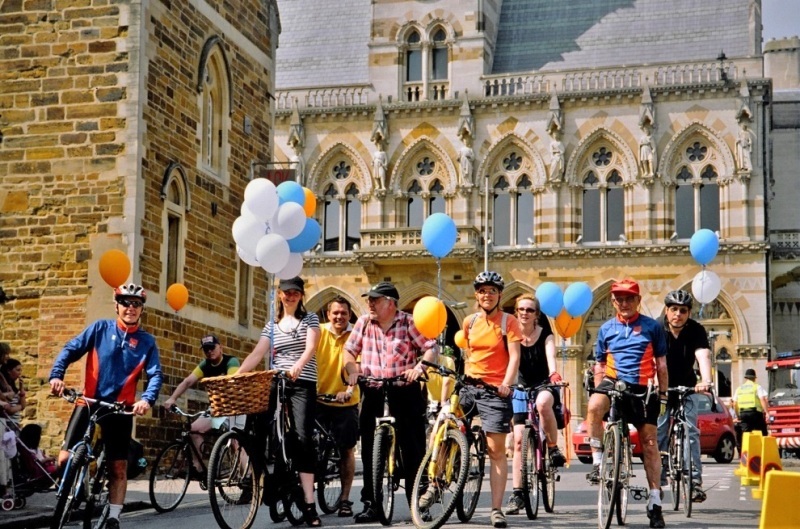 Some time ago Mr J.Porteous made the suggestion to the members of the Hospital Week Committee that a grand parade of all cyclists in the town should be held, a collection to be made among the spectators in aid of the funds of the Northampton Infirmary. As was only to be expected this idea, at once original in conception and benevolent in aim, was favourably considered, and very soon invitations were issued to the Captains of various Clubs in the town to attend a series of meetings with the object of making arrangements for the event. 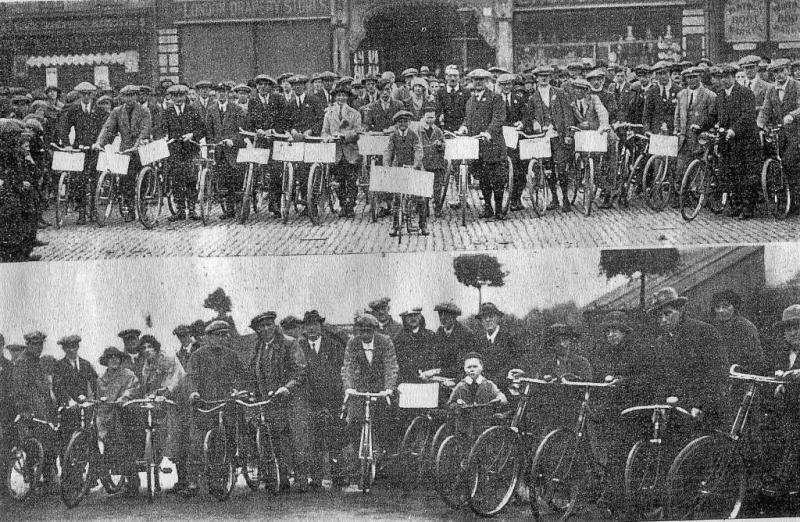 At these gatherings it was decided that the parade should take place on Tuesday, and all cyclists, attached and unattached were asked to assemble on the Market-square, whence the procession was to start at seven o'clock. The request was largely complied with, and when the procession commenced at a quarter to eight it was composed of about 360 riders. The Rover's Club was represented by nearly 90, the Athletic Club by about 40, and Mostyn by upward of 30; while members of Princess street, College-street, and other Clubs were also present. Special mention should be made of the fact that 13 members of the Earls Barton Club rode over to Northampton to take part in the proceedings. In the procession there were two or three curious features. One cyclist was attired in a costume admirably similar in style to that of the shah; two or three wore "Alley Sloper" noses, and Mr A. Dunham rode a hobby horse, in which the seat is placed over the back wheel, and which is propelled by the feet, alternatively placed upon the ground. Mr A. Richardson was mounted upon a pneumatic machine, in front of which, in a chair patented by Mr D. Albone, he carried a little girl. 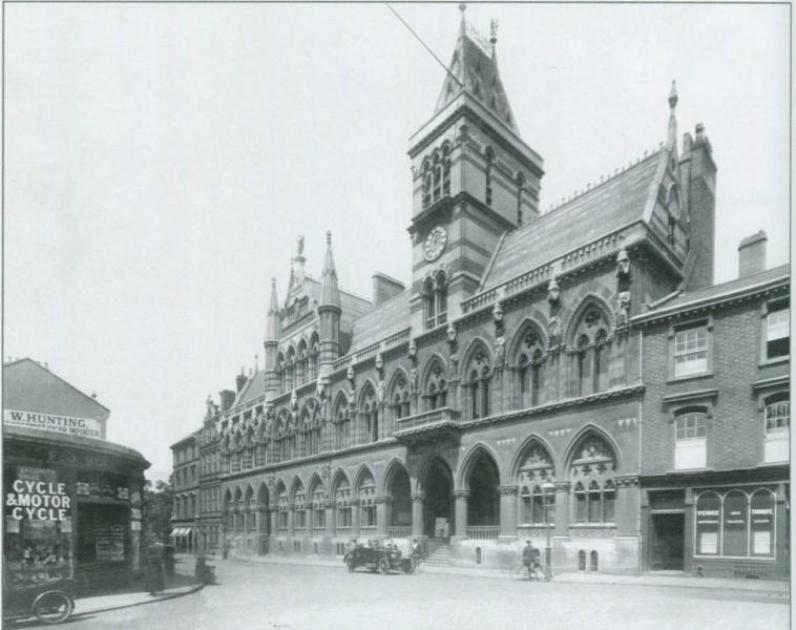 The route was along the west side of the Market-square, Mercer row, the Drapery, Sheep-street, Barrack-road, Lorne-road, Military-road, Clare-street, Kettering-road, Abington-square, Abington-street, Wood-hill, George-row, Gold-street, Horsemarket, Mayorhold, Broad-street, Regent-square, and sheep-street to the Market-square. Several thousands of persons had assembled to witness the start, and throngs of spectators lined the greater part of the route, the greatest conceivable interest being manifested in the proceedings. The collection on the square amounted to £9 6 shillings, and at a smoking concert, for which many of the cyclists, after the procession, adjourned to the Peacock Hotel, this amount was increased by a whip round to £10 10s. At the concert Mr Sprittles occupied the chair and Mr J.Porteous the vice-chair,and excellent songs were given by the vice-chairman, Messr G.York, G. Carpenter, A.J.Ashby, W.Burroughes, P.Troup, J.Wright, G.Johnson, A.M.Dunham, A.Richardson, while Mr.W.Dunham was heavily applauded for a recitation entitled "The kissing cup race." It only remains to be added that an admirable selection of music was played on the Market-square by the members of the St.Paul's Brass Band, under the capable conductorship of Mr.T.Jones. 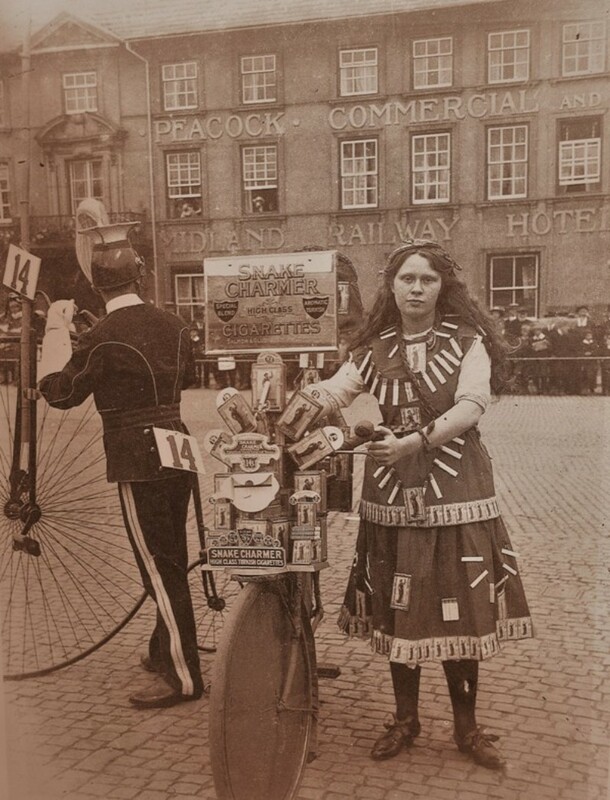 Two entrants in a Parade c1900 wait the judging on the Market Square. With snake skins around her neck, wrists, the lady is advertising a brand of Turkish cigarette called Snake Charmer, sold in King sized cork-tipped form at 3s 3d for twenty. Twelve riders led more than 30 floats through the town centre on the 17th June, where hundreds of people stopped to see the fun. 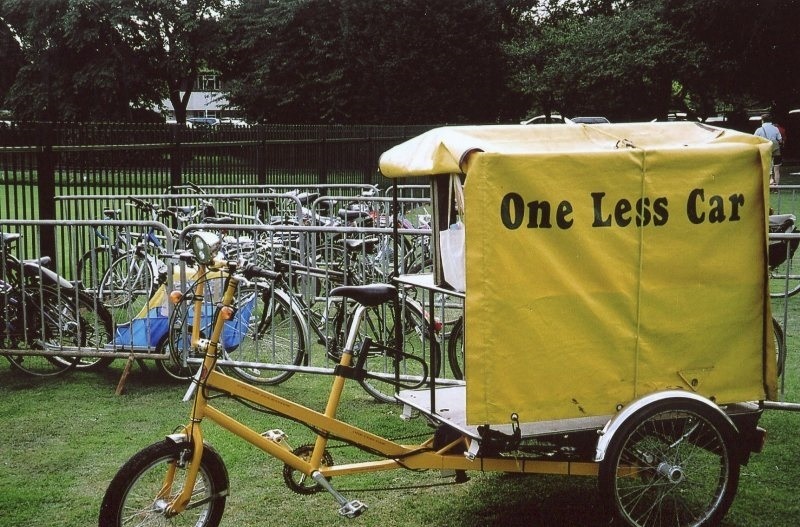 Bikes were decorated with balloons, ribbons, CDs and posters to illustrate the carnival's colours of the rainbow theme. Riders handed out Bike Week leaflets and club newsletters to spectators. In the decades that followed, there were several further changes in club name and structure. In 1990 the District Association changed its name to Northamptonshire and North Buckinghamshire DA, with various local sections at different times in Northampton, Wellingborough, Kettering and North Buckinghamshire. 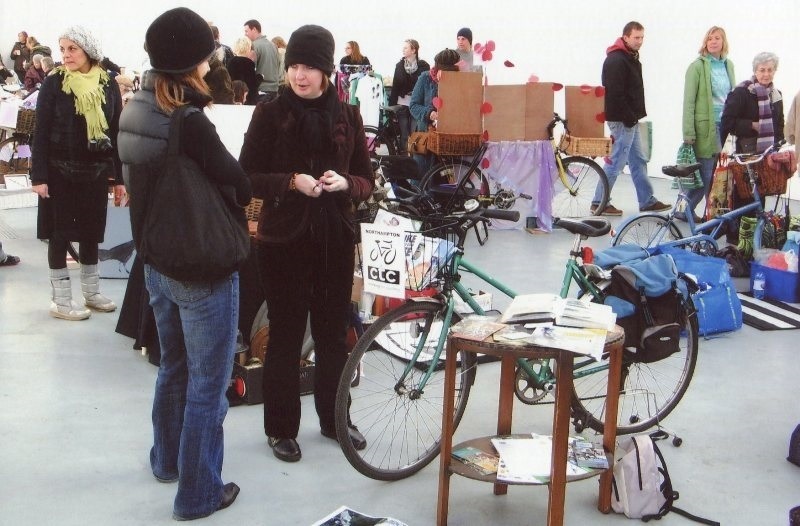 In 2007, the CTC nationally changed its local group structure, aiming to make it easier to create local member groups. DAs were abolished, and sections required to become local member groups with their own formal structure. However, where members wished to retain a two-tier structure, the former DAs could become "parent" member groups, looking after a number of local member groups. 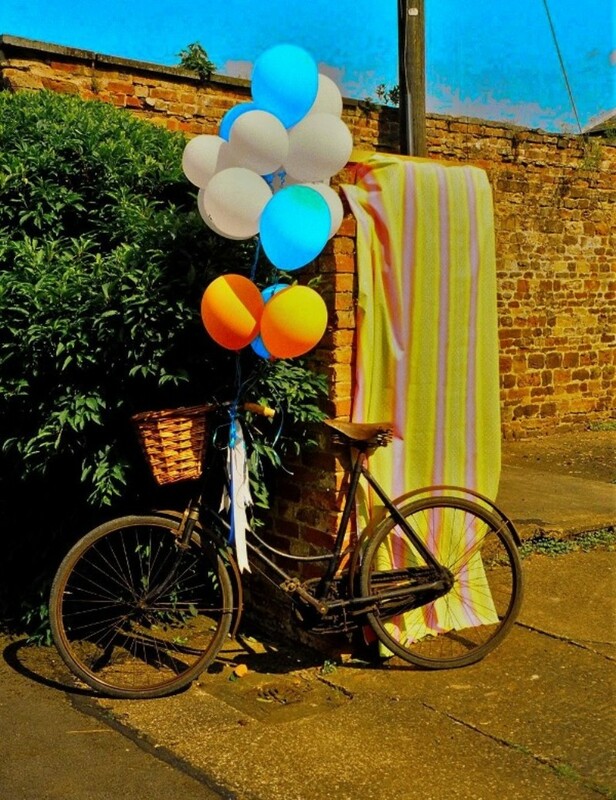 This was the approach adopted in this area, with the DA becoming the Northamptonshire and Milton Keynes member group, acting as a parent group to the new local groups in Northampton, Wellingborough, Kettering and Milton Keynes. At the same time, the Northampton section became the CTC Northampton member group, with its own Chairman, Secretary and Treasurer. The Wellingborough member group became an informal group with no Officers by 2010, eventually becoming an unrecognised group in 2013. Leaving three remaining member groups in the Northamptonshire and Milton Keynes Member Group. 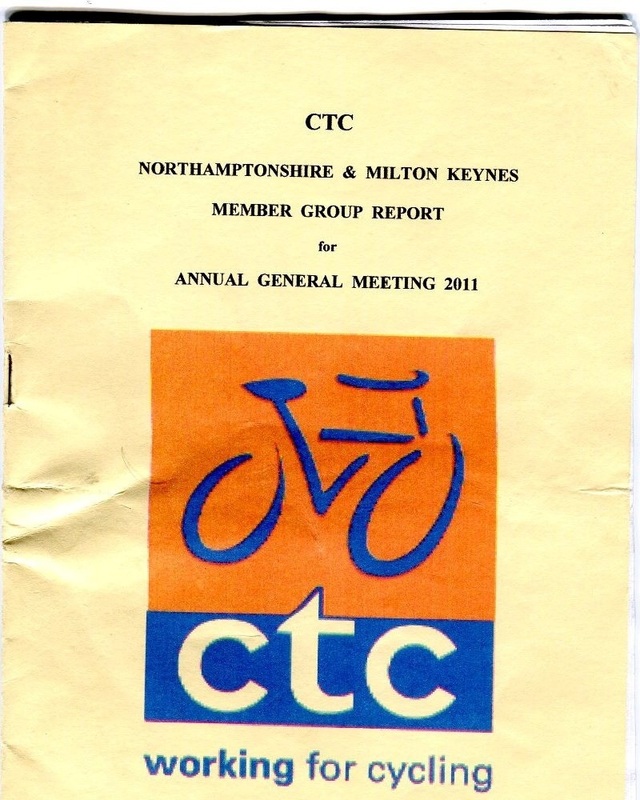 In 2014 the CTC Northamptonshire and Milton Keynes Member Group was dissolved, devolving the parent Group administrative powers and finances to the three sub-groups. The following year in 2015 CTC Northampton became fully autonomous. 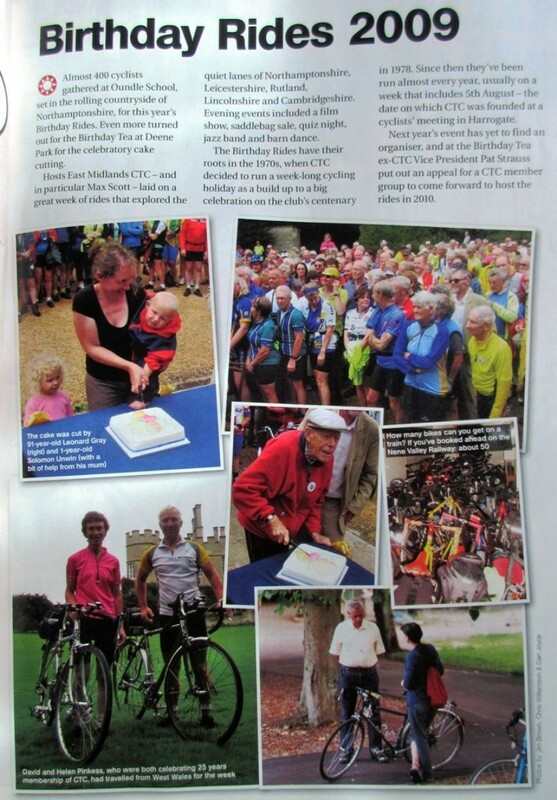 In 2016 CTC Nationally rebranded itself as Cycling UK the Cyclists' Champion. 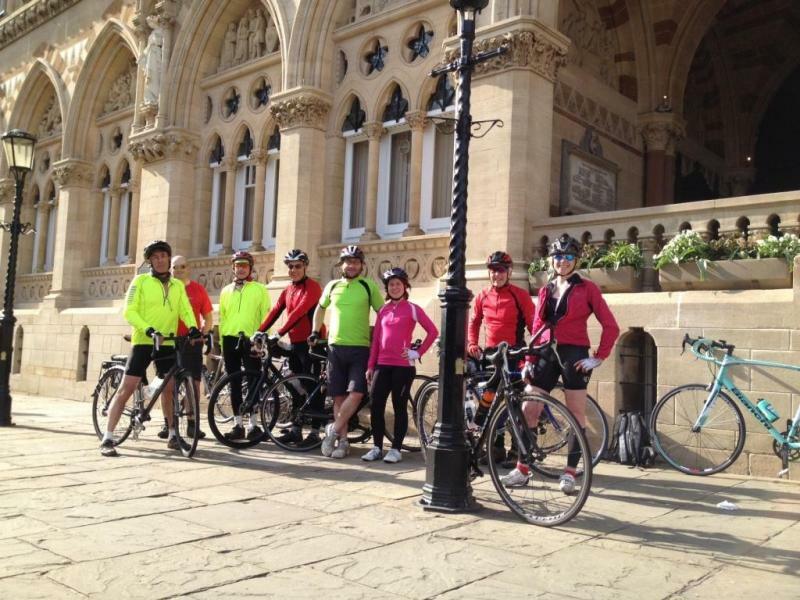 We are now known as CTC Northampton - part of Cycling UK.